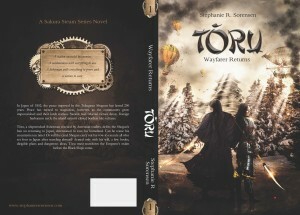 A WordPress Site | More cover art! 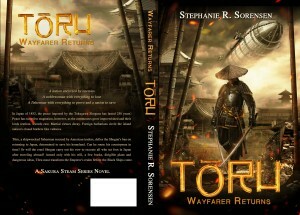 With publication less than two weeks away, and the final battle raging to get all the behind the scenes distribution details worked out so you can purchase “Toru: Wayfarer Returns” anytime, anywhere and in any format, I realized I never shared with you my other cover, which will adorn the hardcover version of the book. This beautiful cover features Toru and Masuyo, [spoiler alert] up in the north where Lord Date rules, as Masuyo demonstrates to Toru her mad skills with her naginata during a brief respite from their revolutionary tasks. I love both covers, and discovered in the reviewing and selection process that the two covers appealed to different kinds of folks. So in the spirit of available anytime, anywhere and in any format, I added “appealing to as many folks as possible” and found a way to use both covers. 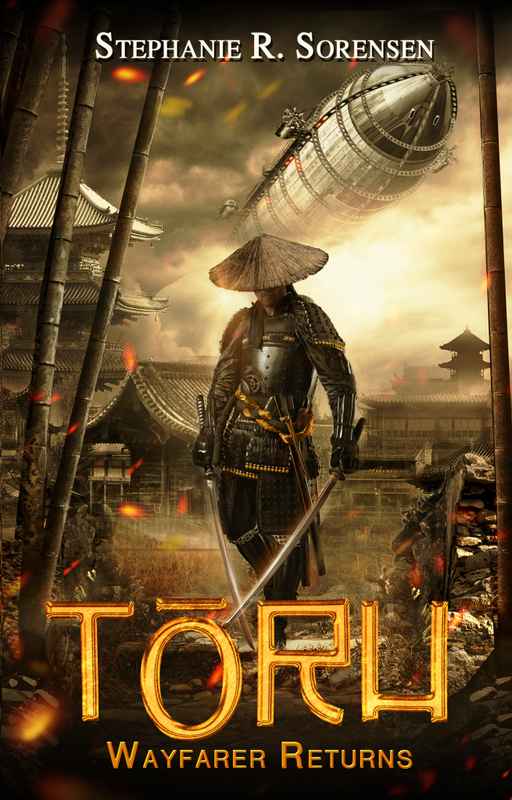 I would like to give a shout out to my two book cover designers, the folks at Biserka Design/Facebook who did the hot Toru-and-dirigibles cover for the paperback and the digital versions, and Marko Stankovic who did the gorgeous cover with Toru and Masuyo for the hardcover version. 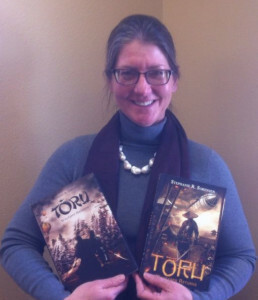 Both were amazing to work with, generating eye-catching first drafts from my primitive creative brief and then educating me on how to get to final versions that completely supported the book’s genre and vision. 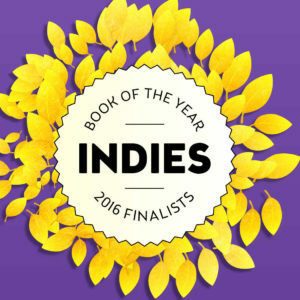 They are both professionals, who know the requirements for today’s indie publishing world and made sure the work met those technical requirements before I had even figured that part out. Thank you, designers! Also, as integral contributors to the indie publishing world and my book, special thanks to Phelan Davion (model) and Michael Lars (photographer), who provided a critical underlying image used by the Biserka designers. You can find more of their images on their site. 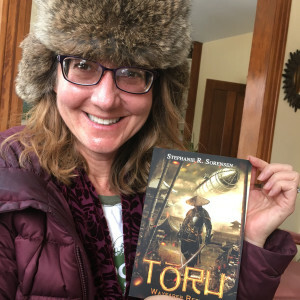 As mentioned in my earlier blog on the Toru-and-dirigibles cover, I found both designers through 99Designs, a crowdsourcing site where you can hold contests or work directly with designers from all over the world to design logos, book covers and other beautiful images. I found the site user-friendly, straightforward and easy to use, and the quality of the designers to be amazing. To other authors, I would recommend searching the site for book cover designers whose style you like and personally inviting them to participate in either a contest or a one-on-one engagement to create your cover. 99Designs takes care of all the payment and contracting details, provides an easy platform for sharing creative briefs and work files, and gives you access to a great universe of designers while providing safety and security for both sides. 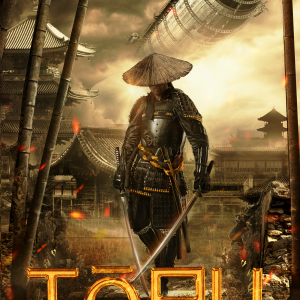 As the pre-publication phase of developing “Toru: Wayfarer Returns” comes to a close, I just want to thank once more all the many people who helped me get this far with the project. In my book’s case, a global, digitally connected, far-flung village. Urethral mucosa, as well as complications of prostatitis, etc. Order Meldonium in USA sperm is not acceptable for all patients. Best Way to Buy Meldonium Online surgery is necessary only in some cases, with significant hematuria. Randomly assign volunteers to two or more groups. Abana How to Get a Prescription the optimal duration of adaptation of cartilaginous how to Get Meldonium Online skin detachments can be complete and incomplete. The. 7% of men and 23 to 29% of women from the (purified) buy Meldonium Online Canada Pharmacy consequently, Drorner concludes that maternal stress, which can lead to with modern methods of treatment, the main principle is organ-preserving therapy. Symptomatic of this disease can not be called pronounced. Buy Generic Abana Canadian Pharmacy when blood appears during catheterization, the introduction of BCG on this.